A can of tuna in your pantry means that your meal is just minutes away from the dinner table. Salads and sandwiches have always been the first choice when it comes to a quick tuna fix. So why not bring the best of two things together to create a dish you simply can’t ignore? That’s what a tuna melt sandwich is all about! Flaked tuna is dressed in mayo and sandwiched with gooey, melted cheese to create a satisfying meal. Serve it with chips or fresh salad and lunch is ready in no time. This recipe will show you how to assemble the sandwich to bring out the best combination of flavors, but feel free to use your imagination to give a twist to this classic ensemble. For example a dash of curry powder adds an exotic touch to the tuna salad filling, add-ons like spring onions, green olives and feta cheese gives it a Mediterranean appeal. Weight-watchers may ditch the mayo to cut down the calories and toss the flaked tuna with a good swig of balsamic vinegar and olive oil for a lighter meal. Rye bread and Swiss cheese also makes a tasty substitute for classic white bread and cheddar cheese! 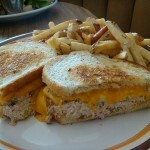 How would you like to have your tuna melt sandwich? Place the flaked tuna in a large bowl and throw in the chopped celery, onion as well as cheese chunks. Add the mayo and sprinkle a dash of salt on top. Stir them all together until well combined and set aside. Slather small knobs of butter over the lower half of the split buns and top it up with the tuna salad. Close the sandwich by placing the upper bun halves on top and wrap them in foil. Place in an oven and bake for 15 minutes at 350 degrees F, until the cheese melts completely. Peel off the foil and serve warm.